For the most part, installing a hard drive in the Tyros2 is well covered in the Owners Manual. The simple step-by-step instructions are straightforward and well illustrated. Be sure to read all the warnings and notes before beginning, as they are important. The main purpose of this article is to bring together all the pertinent information relative to installing, formatting and partitioning the hard drive. The first question you may wish to consider is "Do you want to install a hard drive?" What advantage will it provide over a USB flash drive or USB hard drive? If you do not intend to use the on-board audio recording system, then an internal hard drive won’t provide as much flexibility as an external drive. To access the installed hard drive from the computer, you still must hold down the [Music Finder] button while turning on the Tyros2. This method is referred to as “Accessing a hard disk drive via the USB Storage Mode.” And, you have no other access to the Tyros keyboard functions while in this mode. You must turn the keyboard off and then back on again to return to normal operation. While a USB device is connected to the instrument, you should wait for six seconds or more between these operations: When turning the power of the instrument off then on again, or when alternately connecting/disconnecting the USB cable. One more caveat, you must format the installed keyboard drive using the keyboard format utility if you want to use the on-board audio recording feature of the Tyros2. The reason for this necessity is that the Tyros2 installs some special files and folders needed to make the recording feature work properly. There is no function available for partitioning the on-board hard drive. However, some early Tyros owners have discovered that the hard drive can be removed from the Tyros2 after the format operation has completed and can then be partitioned using a software program on the PC called Partition Magic. Pressing forward then with the installation, the first step is to decide on the drive brand and storage capacity. Table 1 compiled by Yamaha and found at the end of this article, lists the drives known to be compatible with Tyros2. Before following the steps below, make sure you have an appropriate hard disk drive, #2 Phillips screwdriver and the four screws included in the T-2 shipping box. If you have lost or can’t find the screws for installing the hard drive, you must be very careful about the screws you do use. Screws, which are too long, will destroy the hard drive. You can obtain the correct screws at most computer stores, Best Buy, Radio Shack or comparable stores. Please use the Owner’s Manual opened to Pages 221 and 222 to supplement this article. 1. Turn the T-2’s power off, and disconnect the AC power cord and all other external devices. 2. Turn the Tyros2 face down on a blanket or some soft surface, giving you direct access to the bottom of the keyboard. You could place it on a couch, bed or on the carpet. Just be careful to NOT lift the keyboard by the keys. Please place the hands on each end of the keyboard while handling it. 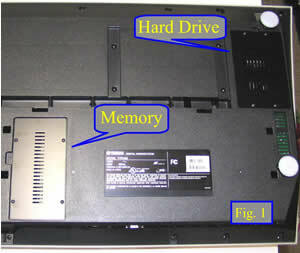 Both, the memory and hard drive covers are shown in Fig.1. 3. 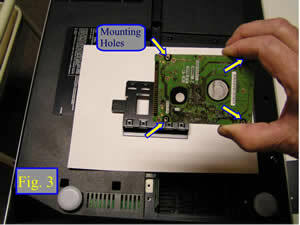 Remove the four screws from the hard drive outer cover to reveal the hard drive bay as in Fig. 2. 4. 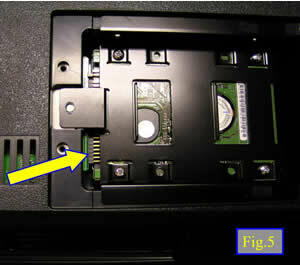 Remove the screw from the hard disk mounting cover as indicated by the Arrow in Fig. 2. The four screws removed from the external cover and the screw removed in this step are all identical. 5. Take note of Fig. 3 and observe the precautions for handling the hard drive. Grasp it only by the edges and do not touch the circuit board or the connector pins as static electricity from your body could destroy the delicate circuitry of the drive unit. The hard drive shown in Fig. 3 has the mounting screw locations at the points shown by the 4 arrows. Some drives have the mounting holes located closer together and the hard disk cover has alternate hole locations to match different style drives. 6. Attach the hard disk unit to the hard disk cover using the included four screws. Fig. 4 shows the hard drive attached to the drive mounting cover. 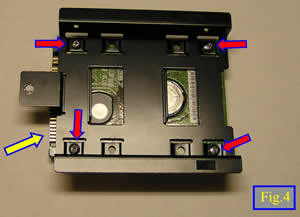 Notice the location of the connecting pins of the drive unit as indicated by the Yellow arrow. The Red arrows indicate the supplied screws. 7. 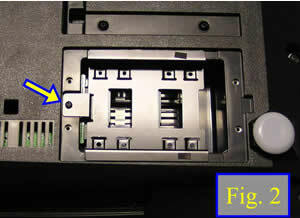 Replace the hard disk drive and cover by fitting it into the T-2 as shown in Fig. 5 taking care to properly align the connecting pins indicated by the Yellow arrow. Once the pins are fully seated and no longer visible, the screw hole in the drive mounting cover will be aligned and you can now replace the screw removed in step 4 above. 8. Replace the outer cover and attach it with the four screws removed in step #3. 9. Now that the hard drive has been installed and the keyboard is back in place and all external connections reattached, it is time to format the drive. 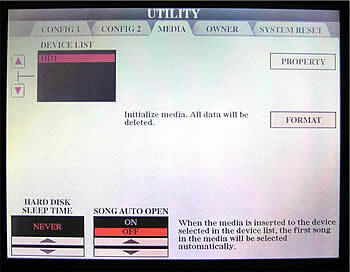 Turn on the T-2 and go to the Utility Media display page by pressing the [Function] button; selecting [Utility] from the Function Menu and using the [Tab] buttons to move over to the Media display, as shown below. 10. The hard drive will be listed in the Device List box in the upper left corner as HD1 if the T-2 recognizes the hard drive. If your hard drive does not show here, then either it is not installed correctly, not working or is not compatible with the T-2. 11. Before doing the following, be sure that you do not want any of the information or files that may already be on the hard drive, as everything will be erased during this operation. Select the HD1 by using the [A] or [B] buttons to the left side of the screen. Then select [Format] using the [H] button. This will format the drive and install files needed for the wave recording feature of the T-2. If you are installing a drive previously installed and formatted on a PSR9000, you may be able to use the drive as is without doing a format. 12. The T-2 drive has the same limitation as to the number of files allowed in any single directory. The maximum number is generally 250, but I would not try to place more than 200 in a folder because some larger files apparently decrease the number allowed. Table 1. Hard drives that are compatible with the Tyros2. How Big or Fast Should Your Hard Drive Be? ..... A faster drive is fine, if you have the extra cash, and don't mind the higher noise. Will it make your Tyros2 perform faster in any way? Not a chance. Let me explain why, and hopefully prevent some owners from making a costly mistake. 2.5" hard drives today spin at either 4200, 5400 or 7200 revolutions per minute (rpm). The faster the discs spin, the faster a drive's "seek time" will be. The seek time is the (average) time it takes for the read/write heads of the drive to move to the correct place. Also, faster drives have faster internal data transfer rates. This means how fast the drive is able to actually read a chunk of data into the drive's internal cache, ready to be bursted to the system, through the drive's "interface", which, in the Tyros2's case, is IDE/EIDE (ATA-100). Now, let's consider the usage of a drive. When used in a computer, a faster drive will greatly benefit the system. When you boot up Windows, for instance, the operating system is in effect reading hundreds of small files scattered across the hard drive, in which case the better seek times of faster 7200 rpm drives are very welcome. The computer will have finished booting several seconds earlier than it would have with a slower drive. But what about when used in the Tyros2? What type of usage can we expect? The hard drive on the Tyros2 is used for recording digital audio (HD recorder), loading/saving custom styles, custom voices and samples. The bitrate of digital audio recording is about 1.4 Mb/s. 4200 rpm drives have an internal transfer rate of around 370 Mb/s. 5400 rpm have around 440 Mb/s. 7200 rpm have around 500 Mb/s. So it is clear that even with the slowest 4200 rpm drive, you would have absolutely no problem using the HD recorder on the Tyros2 - even in full duplex mode (which is also possible, it means you hear your previous recording and can at the same time record on top of it). This would use double the data rate. 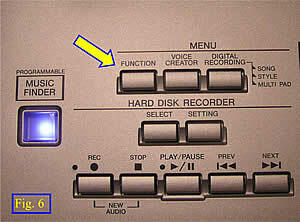 But as we can see, HD recording uses only a fraction of the data rate capabilities of any available 2.5" hard drive. What about seek times then? Well, there are no "many small files" to load. You always load just one style, one midi, one registration setup. In effect, usually one file. What are the differences in seek times between these drives? 4200/5400 drives typically seek in 12ms (that's MILLISECONDS) whereas 7200 rpm drives do it in 10ms. As you know, a millisecond is one-thousandth of a second. This means in theory, the faster 7200 rpm drives can load a style "two one-thousandths of a second" faster than the slower 5400 rpm drives. In practice however, there would be no difference, as the Tyros2 operating system is fairly slow in itself, wasting any speed gains in actually reading the style data. As we know, the USB ports on the Tyros1 are v1.1, which effectively kills the advantage of any fast hard drive when importing / exporting samples or music. It is just terribly slow and I know, because I've already used it. There is just one scenario where one could slightly benefit from having a 7200 rpm drive: loading a HUGE sample into Tyros2's sample memory. Let's say you have imported a 500MB voice library using your USB thumb drive (and waited for half an hour for it to finish), then want to play with it. 500MB equals 4000Mb (MB=Megabytes, Mb=Megabits). With the theoretical transfer speed of 440Mb/s, my 5400rpm Samsung would load this in 9 seconds, whereas the faster Hitachi (at 500Mb/s) would manage it in 8. Just my (more than) two cents worth. - "thewolf"